His hands on his hips, about to stride forwards, Oscar Nemon’s 1970 bronze of Sir Winston Churchill stands at the heart of British democracy – in the Members’ Lobby of the House of Commons. It is a fitting place for the work of the twentieth century’s most distinguished portrait sculptor, and a man who earned Churchill’s respect as well as his friendship. 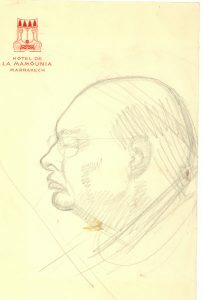 Nemon wrote in 1953 that he considered Churchill “one of the most remarkable personalities of all time”, having admired him throughout the war. The two men first met at the La Mamounia Hotel in Marrakech early in 1951. Born in Yugoslavia, Nemon had lived in Britain since the 1930s, but had lost almost all his family to the Holocaust, leading him to view Churchill with the depth of feeling which brings his portraits of the statesman so intensely to life. Lady Churchill asked Nemon if she could keep the terracotta bust he made at La Mamounia because it “represents to me my husband as I see him and as I think of him.” Shaped in Nemon’s hotel room, it began a creative collaboration between the two men which made Nemon Churchill’s choice of sculptor when Elizabeth II commissioned a bust of Sir Winston for Windsor Castle in 1952. 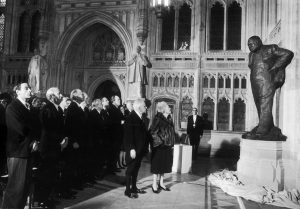 Other notable portraits followed, including a 1955 seated bronze for the Guildhall, which Churchill unveiled, calling it “a very good likeness.” They reflect the energy of the sittings during which they were created. In his unpublished Memoir, Nemon recorded finding his distinguished subject “bellicose, challenging, and deliberately provocative”. 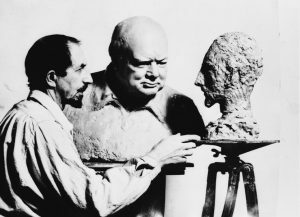 The resulting sculptures became “not merely a likeness, but a biography of his life” — as Nemon had told a journalist he hoped they would when interviewed while sculpting Churchill during the 1950s. Nemon was himself the subject of Churchill’s only sculpture, created while Nemon was sculpting Churchill, and now on display at Chartwell and in the Churchill Musuem. Nemon’s bronzes of Sir Winston Churchill are now to be found all over the world. They stand in Bletchley Park, Chartwell, Churchill College Cambridge, the Cabinet War Rooms, The Guildhall, and the Houses of Parliament in London, St. Margaret’s Bay, Dover, in Westerham, Kent, at Windsor Palace, in Brussels, Copenhagen, Luxemborg, Monte Carlo, Moscow, Paris, Zagreb, Israel, Quebec, Toronto, Edmonton, Fredericton, Halifax, Kansas City, Hyde Park, New York State, Canberra and Mexico City. 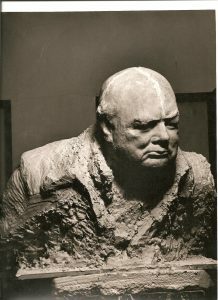 Bronze resin and resin casts of Nemon’s busts of Churchill are for sale through the Estate of Nemon website, eBay, at the Churchill Museum, Chartwell, Blenheim Palace, and the National Portrait Gallery.